A new exhibition has just opened at the Cotswold Motoring museum at Bourton on the Water celebrating the work of the Road Rescue Industry. We all need them at some time or another yet the national breakdown service that we have come to rely on today is reletively recent. 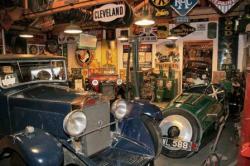 The exhibition has been put together by the Cotswold Motoring museum and the Recovery Industry Support Charity(RISC). Breaking down on a journey can be stressful, unpleasant and even dangerous. If you were unlucky enough to have a breakdown before the 1960s there was no automatic "get you home service". Generally you had to pay up front before anyone would recover your vehicle. Many of the first garages emerged from the blacksmith's trade who naturally took to recovering their customers broken-down vehicles, often towed to the garage by horses! As the 20th century got underway two motoring clubs became large enough to have nationwide membership. The Royal Automobile Club (RAC) formed in 1897 and The Automobile Association (AA) formed in 1905. Today's recovery industry can be traced back to the late sixties. 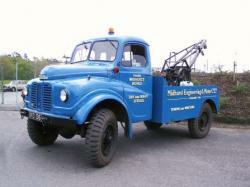 It was not garages that operated recovery vehicles but coachworks and bodyshops as they needed to find work. They monitored the police radio network, listening for accident reports, and then raced to be first at the scene. The AA were the first to respond with their Relay Service in 1974 then in 1975 the RAC introduced their service, aptly named Recovery. Having the correct equipment is essential to carrying out a successful recovery operation and initially a number of army surplus vehicles found their way on to garage forecourts but a number of operators built or converted the equipment themselves. The centrepiece of the exhibition is a pair of Model T Fords which were converted in the 1930s, one as a service vehicle and the other as a recovery vehicle. Submitted by Army Surplus Vehicles on Sat, 08/11/2008 - 22:02.